FAQs » Frequently Asked Questions (English) » How do I install DonorWise on Windows 8 or 10? As of DonorWise 3.4.13, no workarounds are necessary to install DonorWise. The installation correctly handles installing the Microsoft .NET framework or Microsoft SQL Server Express when needed. The "fixer" is no longer necessary to run on Windows 10. Screenshot of DonorWise on Windows 8! Installing MS SQL server 2005 backward compatibility SP4. Extraction of the installation data has failed, what would you like to do? Download a fresh copy? or try to extract the existing download data again. Either option fails when I try it. What can I do? And place it right next to "SetupDonorWise.exe" and restart the installation. When installing/uninstalling DonorWise, you'll need to first start the Fixer in a special way: right-click on it and "Run as Administrator". Normally you should only have to start it as normal for DonorWise to run on Windows 10. It must be always be running before you start DonorWise. It's not a one-time fix. I still am unable to install this software I am having difficulty with the installation of Microsoft SQL Server 2005 Express Edition SP4 - It is not compatable with windows 10? I get an error as follows: Microsoft SQL Server Express 2005 SP4 (x64) could not be installed. Please use WIndows Update to manually install this update on your system. Windows 10 Fixer does not appear to be available on any of the links on your site that reference it. What are my options to get it to work on Windows 10 now? @Margie Huffman, be sure you install the .NET Framework manually first. @benagee, The Windows 10 Fixer is no longer necessary. 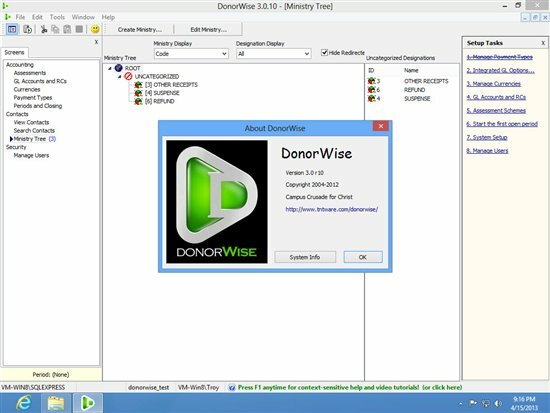 DonorWise 3.4 is compatible with Windows 10.